Changing career is like turning a liner - it's slow, and turning the wheel is only a small action in a series of events. Once you've turned the wheel or made the decision, a lengthy process is underway. Unless you have been made redundant, most of the activity leading up to that decision will have been within your own conscious control - deciding, planning, taking action. After that, you'll still be taking steps, doing things, making things happen. However something else will be going on beneath the surface: something that, if you're not aware of it, may scupper your plans in the short-term. If you are aware of this process, you can make allowances for it in terms or energy, time and space. The diagram below is a seven-stage adaptation of the five stages of grief identified by Elisabeth Kübler-Ross, the acknowledged expert on grief and bereavement. Following publication of her book On Death and Dying (1969), it became clear to practitioners that the stages in the grief model were transferable to all personal change and had a far wider relevance than just to death and dying. change may be difficult at times. It's also exciting, energising and fantastic. It's life. the fact that there is a model does not mean that everyone experiences change in the same way, nor even that one person will experience a similar situation in the same way each time it happens. Every situation is unique. If you know where you are on the emotional map, you'll be better able to deal with your career change. Be aware that an emotional process, whether you're conscious of it or not, saps your energy. You may feel tired, apathetic, angry or depressed. Be patient: don't beat yourself up about it or push yourself. Too much adrenaline-fuelled activity can cause problems of its own. 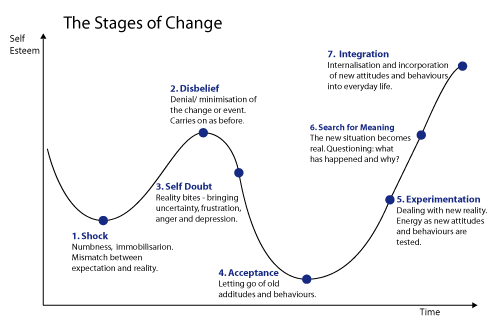 Although the stages hold true for every change event, people experience them differently and at very different speeds. It's rarely a clear, linear journey and the steps are not set in stone. You could whiz through the shock and disbelief stages in a few days, only to get mired in self-doubt for months before you fully accept the situation and start to experiment - both at the same time. Bear this in mind as you read on. Shock. This is an immediate reaction. Even if you've planned your change, when it actually happens you're likely to feel disorientated and strangely disconnected from what is going on. You may be unable to concentrate and have problems with your memory. This state will be more marked and could last longer if the change is unanticipated and unwelcome. Disbelief and denial. The second stage of shock. You get back the ability to carry on with everyday life - a natural survival strategy. Intellectually, you'll know what's happening and the implications. Emotionally, you may ‘box off' the new reality from daily life, as it is processed at a deeper level. This disconnection normally passes with time as you come to terms with the reality. You're more likely to get ‘stuck' in this phase if you're changing unwillingly. Self-doubt. This is uncomfortable. Old attitudes and habits are no longer relevant. You're in limbo until you develop new ways of being. This is especially true of changing career, which is bound up in a sense of identity. Your confidence may be low and you could feel despairing, fearful about the future, angry and resentful or guilty. Doubt creeps in about whether you've made the right decision, whether you're up to it, whether you'll make it. You may not feel like facing people, despite feeling isolated and misunderstood. You may lack motivation. You could experience all this at the same time as being excited - at odd moments or for days on end. Stick with it - it will pass. Acceptance. You're on the home run and able to face the future. Letting go stops being painful and finding new ways of being becomes a challenge rather than a bereavement. Energy levels go up as confidence builds. Experimentation. Don't be surprised if you can't stick to your plan! One week you're on track and the next you're investigating a career in thatching, floristry, setting up a B&B! The world opens up - you could do or be anything. Some people may experience more self-doubt than excitement now - choice and opportunity are not for everyone. If you think you want to change tack, give the ideas time to settle. Write them down, put the list aside for a couple of weeks; if any still look feasible, they're worth researching. Search for meaning. When you have embarked on your new career, you may start examining where you were, what has happened and why. It's time to fit your experience into your ‘story' and to reconstruct your view of yourself and the world. You start to make sense of it. Integration. At the end of the change process, all being well, you will be comfortable and confident, feeling you belong in your new life. Planning what will happen is not the same as living it! Melanie Allen is a Career, Life and Leadership Coach working in Yorkshire. She brings over 20 years of writing and developing Career Development, Leadership and Coaching training, several publications and plenty of life experience to her work. She completed her Diploma in Advanced Executive Coaching from the Academy of Executive Coaching in 2003. Since then she has established her coaching business, working with organisational and private clients both face to face and over the phone. Visit the website: www.melanieallen.co.uk for more information.